오사카, 일본의 아크 호스텔 | 호스텔월드에서 예약하세요. 깔끔한 모던스타일의 도미토리식 호스텔은 당신이 머무는동안 필요한 모든 것을 제공합니다.The Ark Hostel은 그룹손님에게 알맞은 다다미형으로 일본 전통스타일객실,개인 또는 배낭여행객에서 알맞은 이층침대객실이 준비되어 있습니다.각 이층침대에는 개인커튼이 달려있어 객인공간을 만들어주며 좀 더 편안히 주무실 수 있는 환경을 제공합니다. 또한 카페 및 식사공간이 있으며 공용공간의 라운지에서 컴퓨터,게임등을 이용하실 수 있습니다.건물내부 어디에서든지 Wifi사용이 가능합니다. 주방공간에는 식사준비에 필요한 기본조리기구가 갖추어져 있습니다. 샤워실,화장실, 공공장소는 공용입니다. 라운지는 24시간 오픈되며 흡연은 지정된 구역에서만 가능합니다. 2)연령제한: 15세 이하의 손님은 묵을 수 없습니다. ※신용카드로 결제할 시 6% 세금이 부과됩니다. 5)다른 손님들의 편의를 위해 자정이후에는 큰소리를 삼가해주세요. 7)라운지 및 공용공간은 24시간 운영됩니다. (샤워실,화장실,주방,테라스)단, 자정이 넘어서는 세탁기 및 건조기 사용을 자제해주세요. 8)객실 내 또는 공용공간에서 흡연은 삼가해주세요. 1층 2층 또는 옥상의 테라스에서 흡연이 가능합니다. 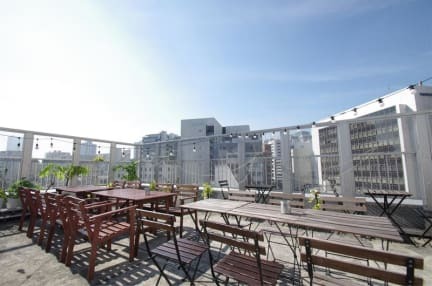 This hostel has everything you need, a must-stay place if you're looking to stay near Namba/Dotonbori. The place is very close to subway stations and the city centre, but the area where the hostel's located is quite calm and nicely peaceful. Amazing hospitality, fully equipped toilets/shower, spacious and private bed, and they also have a native Korean staff which was VERY convenient for me as a Korean who doesn't speak Japanese. Stunningly reasonable price for all of this. Staffs were very kind, and the place was clean and sanitary. It was also quiet, easy to find, and had good services and facilities. Overall, it was very satisfactory. 직원분들 친절하고 좋았어요. 시설도 깔끔했고 청결했어요. 다음에 또 가고 싶네요. Nice and chill hangout! Quite neighborhood and super close subway station. 10min to nanba and 10 min to umeda. The dorm was nice and rest of toilet, shower facilities were excellent. The rooftop is great to have beer and they have card games and even vid games in lounge. If ur looking for place to just chill after seeing too much of osaka busy streets, this is good place for u.